Plasma rockets are the rockets of the future. They use the same stuff that makes up the sun and stars, and follow the same principles that scientists believe govern black holes. And now, NASA is ready to harness that energy for their own devices. 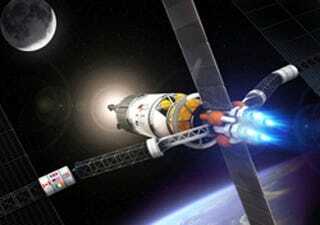 They're planning to test a plasma rocket at the International Space Station. So what, exactly, is a plasma rocket? Rather than heating chemicals and directing the resulting gases through high-temperature metal nozzles, VASIMR uses radio waves to create and speed up free-flying, electrically charged particles known as plasma. The concoction is then herded through nozzles made of magnetic fields, not metals like traditional rocket engines. Designed by a former astronaut who's flown in the shuttle seven times, the plasma rocket will use solar power to produce energy to convert into radio waves. This makes it reusable, and the plan is to have it haul things from low-Earth orbit to low-Lunar orbit, a trip that would take about six months to haul one ton of equipment, and it could be reused six or more times.